Dr. Ibrahim Ahmad, MD, FASN, the founder and president of Kidney Care Specialists, is a board-certified nephrologist who has been practicing for more than 15 years. He completed his internal medicine training in 1998 at the University of Pittsburgh Medical Centers and his nephrology fellowship at the University of Arkansas for Medical Sciences in 2000. While in Arkansas, he was involved in research on treating kidney diseases. He is the current Chief of Medicine at Soin Medical Center in Beavercreek and Greene Memorial Hospital in Xenia. He is the Medical Director for the DaVita Dialysis units located in Fairborn, Xenia and Miamisburg. He is a Clinical Assistant Professor at the Wright State University Boonshoft School of Medicine. He has authored or assisted with many articles that have been published in peer reviewed journals. He has been honored with several awards and appointments. He enjoys traveling, spending time with his family and being around his beloved patients. He speaks English as well as Arabic. Dr. Madhu Kandarpa, MD, FASN joined Kidney Care in 2010 and is a board-certified nephrologist. He earned his medical degree in 1993 from Rangaraya Medical College in Kakinada, Andhra Pradesh, India. He trained in internal medicine at Lankenau Medical Center and Thomas Jefferson University Hospital, where he was Chief Medical Resident, both in Philadelphia, Pennsylvania. He completed his nephrology fellowship at the Albert Einstein Medical Center in 2009, also in Philadelphia, Pennsylvania. Dr. Kandarpa also trained in the United Kingdom and is a member of the Royal College of Physicians, London (MRCP). He is the Medical Director for the DaVita dialysis units located in Wilmington and Eaton. He enjoys traveling, spending time with his family, is active with the National Kidney Foundation and participates in its Kidney Walk and KEEP programs. He speaks English as well as Telugu. ​Dr. Jabulani Sidile, MD joined Kidney Care in July of 2014 and is board-certified in both internal medicine and nephrology. He earned his medical degree in 2009 from St. George’s School of Medicine in Grenada. He trained in internal medicine at Albany Medical Center in New York, where he was the Chief Medical Resident. He also participated in research studies during his time there. He completed his nephrology fellowship in 2014 at Stonybrook University Hospital, also in New York. While he was there, he was the Chief Nephrology Fellow. He has been a volunteer with the Tekeshe Foundation for the past six years. He enjoys traveling, spending time with friends and family and catching up on lost sleep. He speaks English as well as Shona. ​Dr. Ahmed "Sola" Giwa, DO joined Kidney Care in July of 2018. Dr. Giwa is board-certified in internal medicine. He earned his medical degree in 2013 from Rocky Vista University College of Osteopathic Medicine in Parker, Colorado. He trained in internal medicine at Grandview Medical Center in Dayton, Ohio. 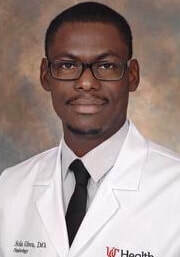 He completed his nephrology fellowship in 2018 at University of Cincinnati Medical Center in Cincinnati, Ohio. He enjoys playing tennis, skiing, watching sports and spending time with his family and friends. Jennifer "Jen" Casey, MSN, APRN, FNP is a board-certified Nurse Practitioner who joined Kidney Care in April of 2018. Jen obtained her Master of Science in Nursing from Chamberlain College of Nursing in 2017. Jen was a RN at Kettering Health Network for several years prior to obtaining her NP degree. ​Wanda Blatter, MSN, APRN, FNP is a board-certified Nurse Practitioner who joined Kidney Care in May of 2018. Wanda obtained her Master of Science in Nursing from Indiana Wesleyan University in 2018. Wanda was a RN at Kettering Health and Premier Health Networks for several years prior to obtaining her NP degree. She is also a United States Air Force veteran.